Police and Local Authority documents are house specialities. For reliable performance, matchless quality and dependable service look no further. Meeting the needs of police enforcement and local authority fixed penalty procedures with peerless documentation systems is one of ROTASET’s great strengths. We manufacture a variety of formats that are in operation throughout the United Kingdom. Documents range in size and specification from carbonless sets, pads and books through to insert mailer applications, unusual formats such as waterproof synthetic FPNs with doubled-sided tape Steratape applied and thermally-imaged products. 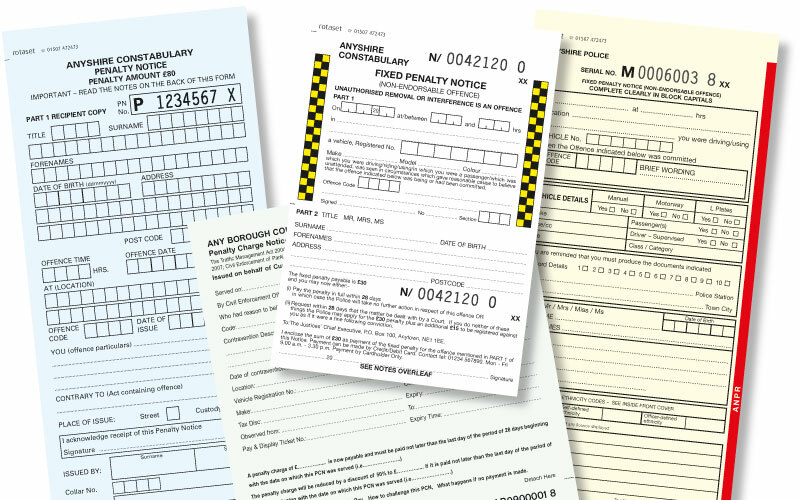 The majority of enforcement documents require encoding to the ‘Northgate’ and newly-introduced PentiP system, with occasional hybrid requirements. Encoded check-digit styles are available in various formats, fonts and orientations. Numbering styles can range from a basic ‘arabic’ number to those suitable for automated computer input – OCRB-1 and barcoding being the ‘norm’.